Find the old wisdom with a new perspective at Proverbial Thought! One of my favorite Michael W. Smith songs is Missing Person. That song was partly inspiration for this poem. It occurred to me, though, that with just that song it can be easy to miss the point. For a Christian who has grown stale, who feels like the passion and the power of Christ is gone, trying to get back to who we once were as a new believer is not the right focus. Our focus must always be on the One who changes us through His power and resurrection: Jesus Christ. Only then can we find that passion and power we once felt. Rediscover wisdom at Proverbial Thought! Three years and nine days ago I heard a song for the first time that I greatly enjoyed, so I shared it on my blog. As I have been finishing my first summer as a Seminarian, I am officially beginning my teaching career (in Special Education with children with Autism), and I have had a jam-packed summer of travels, work prep, and simply getting things done. It has been a little exhausting! Therefore, I think it is a great time to bring back this song as a good reminder to myself, other seminarians, and all those who tend to work too hard and sometimes forget or neglect time with God (like pastors and other ministry leaders, teachers, and just about anyone else in Western culture). This is “Let Me Rediscover You” by the band Downhere (no longer together, but the lead singer of this song is now “Freddie Mercury” for the Queen cover band Queen Extravaganza). Just listen to the lyrics and focus on God for about four minutes! Search out wisdom at Proverbial Thought! I am not big on New Years Resolutions, but really good plans for the future are pretty amazing. The best thing you can do is resolve in your heart every day to let God change your heart and mind. Become skilled at wisdom, and head over to Proverbial Thought! I am not sure where this came from, but I found it in a daily devotional from Bill Keller. May it speak to you, and may it spark something inside you that pushes you into loving service of our God and King! I will let it speak for itself! “I’m a part of the fellowship of the unashamed. The die has been cast. I have stepped over the line. The decision has been made. I’m a disciple of His and I won’t look back, let up, slow down, back away, or be still. I’m done and finished with low living, sight walking, small planning, smooth knees, colorless dreams, tamed visions, mundane talking, cheap living, and dwarfed goals. I don’t have to be right, or first, or tops, or recognized, or praised, or rewarded. I live by faith, lean on His presence, walk by patience, lift by prayer, and labor by Holy Spirit power. My face is set. My gait is fast. My goal is heaven. My road may be narrow, my way rough, my companions few, but my guide is reliable and my mission is clear. I will not flinch in the face of sacrifice or hesitate in the presence of the adversary. I will not negotiate at the table of the enemy, ponder at the pool of popularity, or meander in the maze of mediocrity. I must give until I drop, preach until all know, and work until He comes. Do not forget to find wisdom at Proverbial Thought! 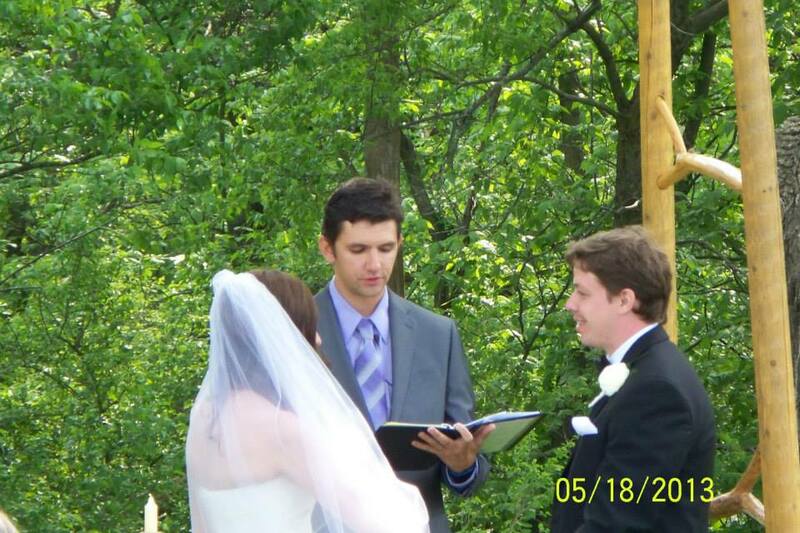 This past weekend I performed my first wedding, and it was for my wonderful sister-in-law and her new husband! Because I know tiredness and exhaustion is big after a wedding, especially when the ceremony and reception last eight hours plus all of the prep-time before and clean-up after, to save myself some time this week I am posting the message from that wedding! To submit to each other means to live life together. The greatest examples of living life together can be taken from Jesus and His disciples. In John chapter two, we read of Jesus’ first miracle: turning water into wine. This is also the time Jesus first went with His disciples somewhere, and it was a wedding! Working together with each other and those around them made life more enjoyable. As you start your marriage, learn from Jesus and His disciples: start by having some fun. This is why we are all here! Take this as a reminder to have fun with each other throughout your marriage. It is also a reminder to have fun with your loved ones, your family and friends. Instead, as soon as everyone was done eating, Jesus sent His disciples across a choppy lake in the only available boat while he went off to pray. Before the sun came up, Jesus walked out across the surface of the lake – with waves and all – to the boat. The disciples were scared at first, but Peter yelled out to Jesus. Jesus called Peter out onto the water, and he went and walked on the water with Jesus! Peter soon remembered the wind and waves, and he began to sink. And Jesus reached out to grab his hand, pulled Peter up, and the two of them walked back to the boat. As you build your lives together, you will encounter those times when life is hard. Yet, when one of you gets distracted by the troubles you face, the other can be the support. You can take turns lifting each other up as you walk together. You never face this life alone. The good and the bad will come in varying degrees, but when you face them together you may find the good in the bad. Submitting to each other is listening to and helping each other continually, that you may grow deeper in love and happiness.